Caftan Woman: What's that guy's name? Christian Rub. We were watching Jeopardy!. The category was Things Related to Wood. Two of the "questions" were "What is Tales from the Vienna Woods?" and "Who is Pinocchio?". 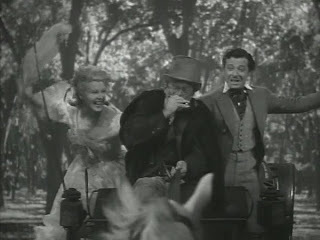 I turned to my husband and commented that this was a good night for Christian Rub (pronounced and sometimes spelled "Rube") fans because in 1938s The Great Waltz he played the carriage driver who helped Strauss and the soprano compose that song, and in Disney's 1940s Pinocchio Rub was the human model and voice for Geppetto. The breadth and depth of my knowledge stunned my beloved into silence. I'm sure he was in awe. Sadly, I have not at this time found no details on Mr. Rub's personal life other than his birthplace in Bavaria and that his wife's name was Amy, but his movie career places him in a number of bona fide classics and personal favourites. Some actors become famous for playing butlers or cops. In Christian Rub's case, he played more than his fair share of janitors and groundskeepers. Check out Princess O'Rourke with Olivia de Havilland, Once Upon a Time with Cary Grant, Mary Stevens MD with Kay Francis, Murder on a Bridle Path with James Gleason (especially! ), All This, and Heaven Too with Bette Davis, Henry Aldrich for President and Rhapsody in Blue among many others. The one valet credit I could find was the Warren William picture Outcast. I have yet to see it, but it looks like a dandy. When not sweeping up, Christian Rub played a number of musicians and music lovers. He's a cellist in the Charles Laughton segment of Tales of Manhattan, a trombone player in Tovarich and is featured in two Deanna Durbin movies Mad About Music and One Hundred Men and a Girl. Christian Rub is adorable as a sympathetic innkeeper in The Cat and the Fiddle with Jeanette MacDonald and Roman Navarro. Above is my favourite performance of a title song of a movie. It is 1940s Rhythm on the River starring Bing Crosby. Christian Rub is the pawnbroker in the background who can't keep from grooving. While searching for photos of Christian Rub online I found him misidentified on a couple of sites. He is not now nor never has been Ian Wolfe or Donald Meek. Such an infraction against all three gentlemen is considered criminal in my family! Look for Christian Rub the next time you watch You Can't Take It With You where he is one of the Vanderhoff's neighbours or Captains Courageous as one of the shipmates. You will soon compile your own list of personal favourites. I didn't know his name but I will definitely remember this post, C.W. Why? Because of Papa Gepetto. PINOCHIO is one of my favorite Disney animated features. I've always loved Gepetto's voice. Like Yvette I didn't know this cute little gentleman's name. I've seen him on the silver screen though. How sad that other sites have given him other names. He would be very proud of your tribute! : ) I loved the clip, pics. Boy, you are the go-to gal for character actors. Great post, and thanks for this background. As Geppetto would say "Music, Professor" and then we'll have the character actor dance performed by Yvette, Page and Jacqueline. Plus, you never know what might help you if you ever end up on "Jeopardy". I'll wager Mr. Rub will be popping up in a lot of movies you watch soon. Life's like that. CW - Your knowledge of supporting players is deep and wide or, better put, astonishing! 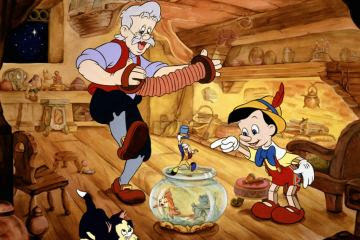 Love this post - and finally finding out who Geppetto was modeled on. I'll have to keep an eye out for Christian Rub now that I know "that guy's name"...great post. Thanks, Lady Eve. As my hubby says, "You know the third cowboy from the left in all the B westerns, but you don't know how much money you have in the bank." Well, one piece of knowledge makes me happy, but the other - not so much. CW, you always have the most interesting posts! Great post - it's always fun to learn something new (about something old). Thanks, FlickChick. I'm glad you had fun. What fun! I had never heard of Mr. Rub, although I was unknowingly familiar with his work. Love the pics and clips, too. Rick, it is a fun clip, isn't it? Have you seen "Rhythm on the River"? It's a riot. Caftan Woman, these posts about character actors are among my favorite kind. 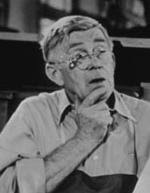 They were the backbone of classic films, and I recognize Mr. Rub from many movies. He was a welcome face in any part he played. I am sure he would feel great to know that you have given him a tribute for his work and his place in film history! Yes, Becky, the family of character actors makes the classic movie world a comfortable place to visit. "... then we'll have the character actor dance performed by Yvette, Page and Jacqueline." I can't do the dance. I left my tights in the glove compartment of Yvette's car (don't ask), and Page still has my tutu from when she borrowed it for a job interview. I hope I can be excused. Well, you're excused this time, Jacqueline. Please keep better taps on your tights! I meant "tabs". "Tabs" on your tights. Of course, you might want to tap. Style is optional. "Of course, you might want to tap. Style is optional." It was originally supposed to be tap, but then Page when all Martha Graham on us. Interpretive dance in gray unitards. I think I'll just wait in the car. Oh, Page and her Martha Graham thing! She forgets some of us can't bend like that any more! Answer: This site is loaded with fascinating information on neglected character actors, and is a must stop on the web for all classic film movers. Question: What is Caftan Woman? Kevin, you have tapped into my inner-most dream. Thanks a lot.